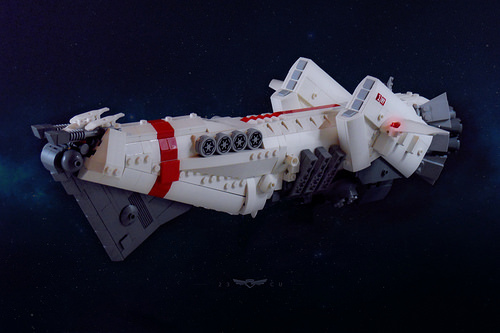 This lovely LEGO spaceship by The Backward One is sure to grab attention as it cruises through the galaxy with enough stylish curves to make a space pirate blush — that is, before he flees in terror from its impressive firepower. Simply put, this is one pretty ship. The sharp angles of the prow contrast nicely with the sleeker curves of the fuselage and missile compartments (the differing angle of the last missile pod is a particularly aesthetic touch). Together the varying styles and color choices result in a pleasingly unique design. Intended to be a Russian vessel, it’s also apparent the builder pays homage to Soviet and Russian military/space designs. It’s an interesting choice and well-executed here. 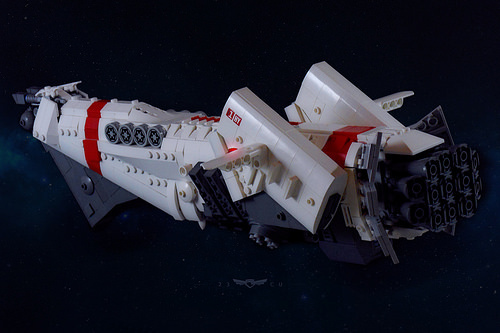 So, although they can’t hear you scream in space, the crew of this stylish ship might see you gaze in awe!